Now, I have been told to pick my words carefully as apparently I may be to blame for this whole, erm, incident. Innocent until proven guilty, I say. Pöh. So, on Monday morning I may have really leapt on Veikko who was quietly sleeping. I may have been a bit snarky with him for a while. He may have been bitten a week or so ago. On Monday evening Äiti came home to find Veikko had grown a hump, as shown. Yes, it was horrendous, and he was not happy. 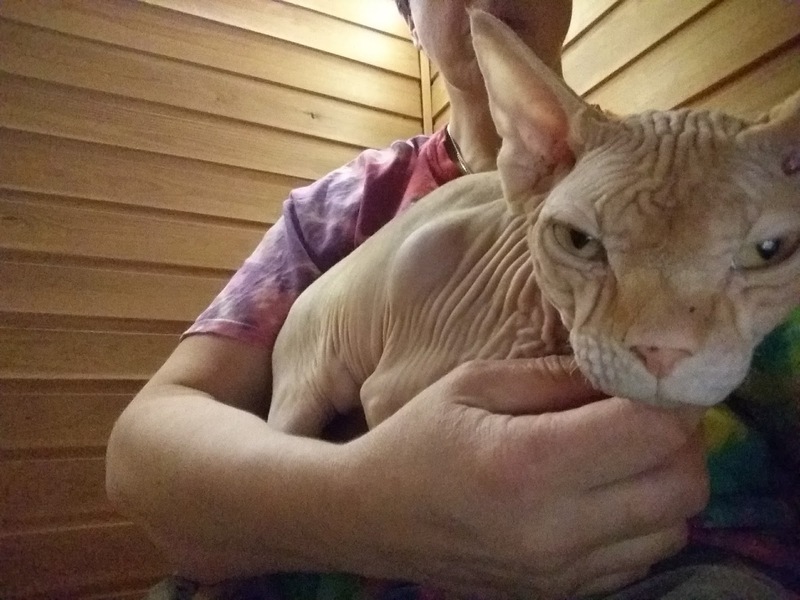 While waiting for ystävämme eläinlääkäri to call, the feverish nekkid sat in the sauna getting a cuddle. Note he wasn't sick enough to forget how to do the stinkeye. Well, he was whisked off to the clinic and sorted out. He had a humungous abscess which made a very icky mess; apparently some kitty bit him. He felt immediately better having erupted pus all over Äiti, and was very brave about the whole thing. He has also tolerated his bandage, which has a rather cool design on it. He has been dosed up on painkillers and antibiotics, and was feeling much better the next morning. He also got to sleep in the bedroom with Äiti while everyone else was exiled. Mirsku has volunteered his snuggle services. And his nekkid buddy has also been providing comfort. For some reason I have not been invited to join them. Apparently ystävämme eläinlääkäri says that we can blame kevät (spring) for all this biting and snarkiness. I like this idea since it means it is not my fault. Äiti, however, is not convinced. poor QuasiVeikko! That's a rather large hump. You poor dear!! So happy you are healing nicely and receiving extra attention (as well you should). Sending purrs and extra smoochies for you. 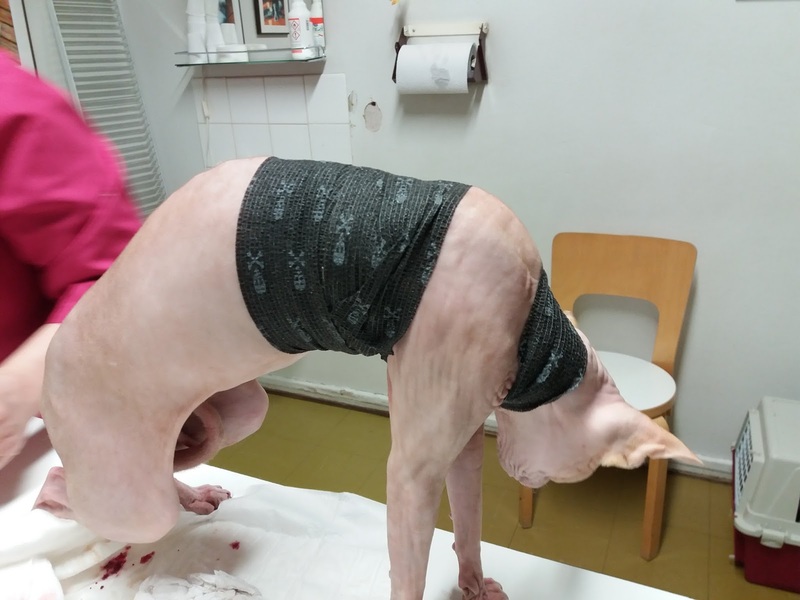 I have to say, this is one time when being a naked boy has its advantages because I bet that abscess got caught way quicker than it might have been covered in fur. 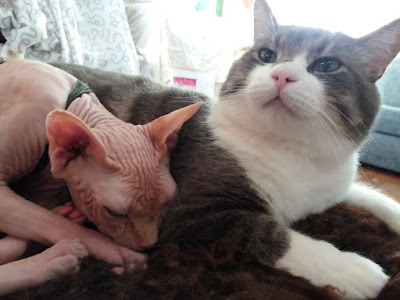 Poor Veikko, that is a big lump. I hope he soon feels better and the perpetrator feels guilty. Poor Veikko!! Amarula feels for you!! Frodo has been especially troublesome since spring began!! Glad you were ok enough to still do the stink eye!! Fur is under-rated as a form of armor. But our great sympathies to Veikko for the attack, the wound, and the vet visit. Poor dear boy! Hugs and cuddles and lots of extra attention. We hope all is well now and you are comfortable. You're a very special kitty to us. Smooch!